The work in “Reality Slips” exists in the elusive realm between expressionism and minimalism, where everything is beautiful and effortless. The three artists in the exhibition, Veronica Bruce, Brian McNearney and Morgan Sims, move fluidly between mediums, grabbing elements from, say, photography or painting, and repurposing them to suit a grander formal agenda. Bruce’s clever assemblages of consumer discards and construction materials play nicely with Sims’ hyper-painterly paintings and eye-catching neon sculptures. Trendy, candy-colored zip ties appear to grow out of abused chunks of drywall, bubble wrap, Plexiglas, or some other manufactured material and held together with elastic hair bands. Grids of color melt away like a Chuck Close painting left out in the sun too long. 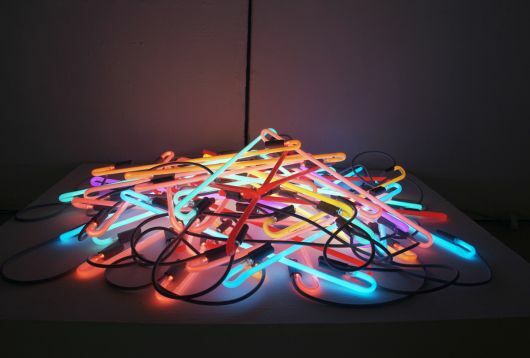 A colorful, pulsating pile of neon sits in the corner like a Pawn Shop sign that found a greater calling.